Have you ever struggled to achieve an objective, and been turned back? I have–a lot! Waring Peak in the Sutton Range is among several peaks that we failed to summit last winter. My first attempt came to a premature end, with the group looking longingly at the base of the summit block, merely 200 metres away from the summit of the mountain. This August, we struck back at mountains that had turned us back last winter. 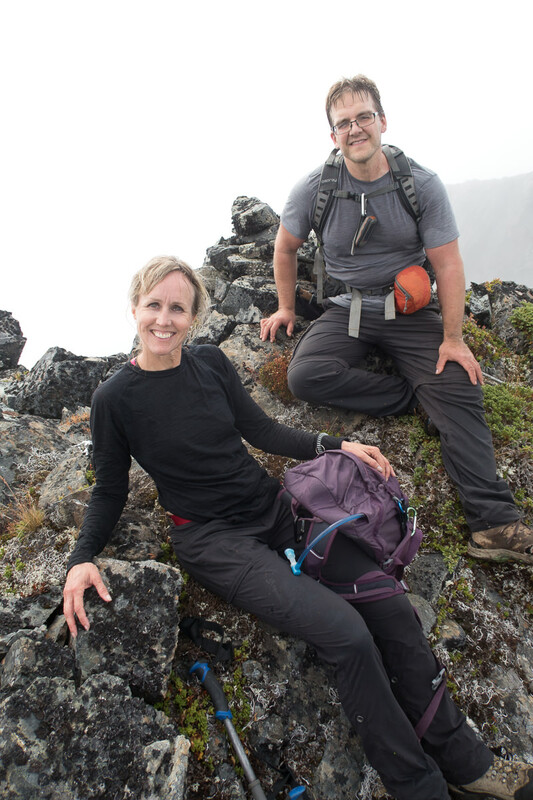 This time, after only 2.5 hours of hiking, we were standing on the summit admiring the view, and enjoying the narrow upper ridge of this Vancouver Island peak. It’s satisfying to gain these summits, but it’s remarkable how different the approaches are in the different seasons. Of note, the biggest surprise is the bush! 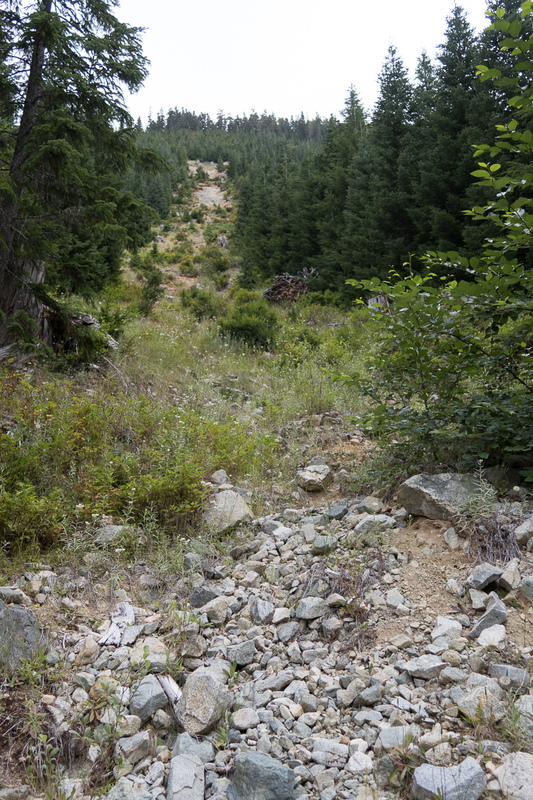 Though we stuck to our original route, I wasn’t keen to drive the final logging spur, where the leafy alder encroached heavily on the grade. This decision extended our distance by 600 metres in each direction. At the time of writing, the dense alder grows on either side of the road grade, leaving a path that can easily be walked. I was grateful for the dry conditions; had the trees been wet, we would have been soaked in about two seconds. 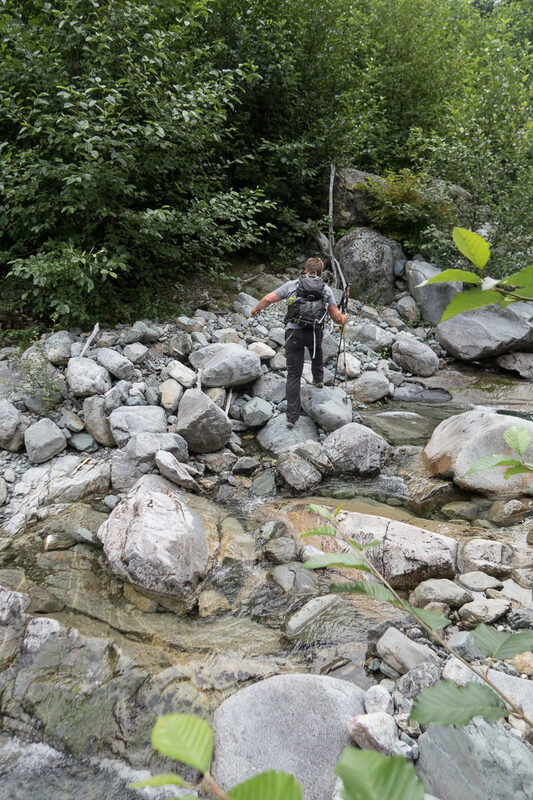 As it was, we easily pushed the brush aside with our hiking poles, and very quickly worked our way along the two kilometres of logging grade, across the creek, right to an obvious slide area. 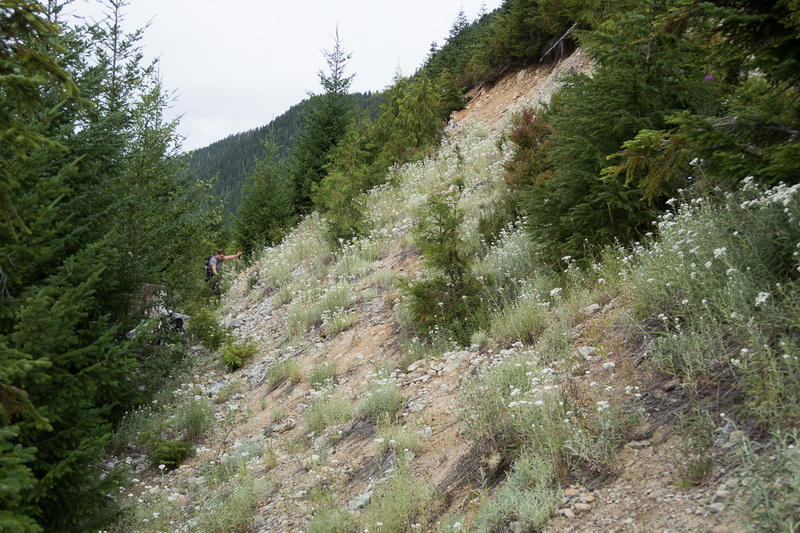 With many bare sections of rock, and just as many sections of loose gravel and dirt, we easily -but very carefully- made our way up the southwest-facing slope. There are worse ways to gain 200 metres of elevation – after taking plenty of care, we found ourselves on Debuilt Road (~960m) in short order! We paused only long enough to look back down the steep slide zone and take a deep breath of relief before we started moving again. It was good to be out of the shooting gallery, but I held dread in my heart over the next section: replanted logging slash. The dread was unfounded; at worst, it was B2. 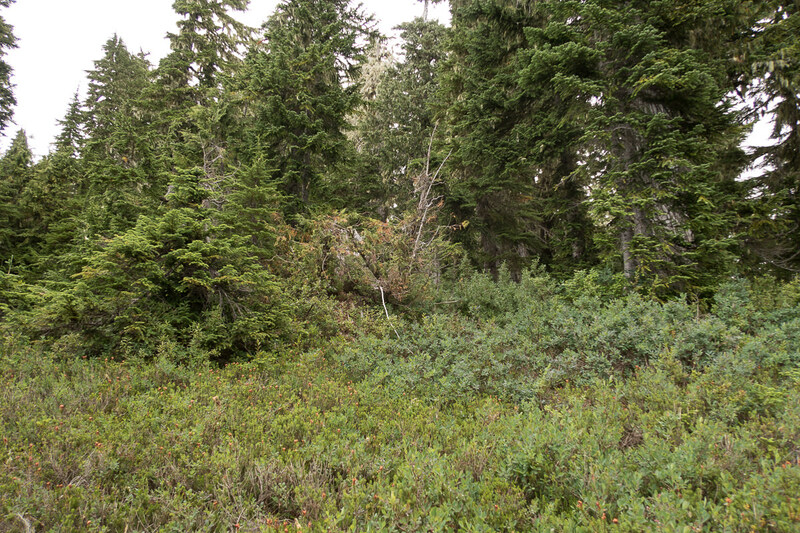 We were able to pick our way through the head-high blueberry and huckleberry, and weave between the regrowing fir trees and old rotting stumps with relative ease. True, we were getting up close and personal with the bush, but it parted easily, and we didn’t spend long wrestling our way through it. 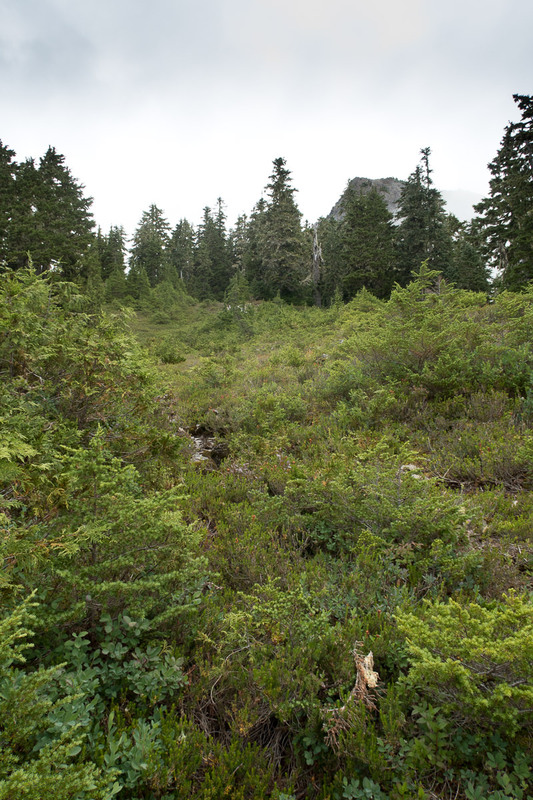 The slash ends at the edge of some fabulous low alpine old growth (~1100m), and we were surprised to see that our time being intimate with the blueberry bushes wasn’t quite finished. We headed east until we gained the crest of the ascending ridge, and then followed that northeast up the slope. There’s very little evidence of an established route: at best, we passed a half dozen flags, reassuring us we were walking where at least one other person had walked. We followed the path of least resistance, and in due course we broke out of the trees onto an alpine meadow (~1320m) – at last, the summit was in view. 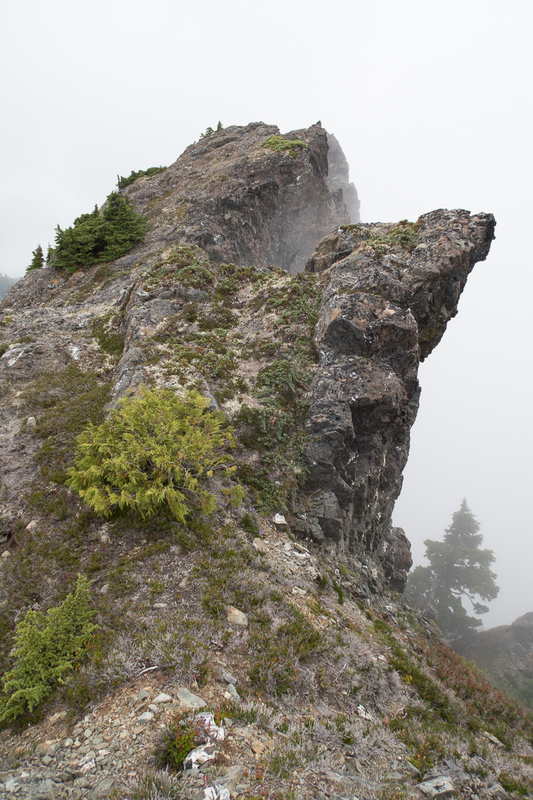 The summit block rose ahead of us, with the highest point of the summit shrouded in mist. I expected to see an approachable route, much easier than the behemoth that we found in the winter, but this wasn’t the case: the rock looked sheer. However, we weren’t ready to give up until we rubbed our noses on it. 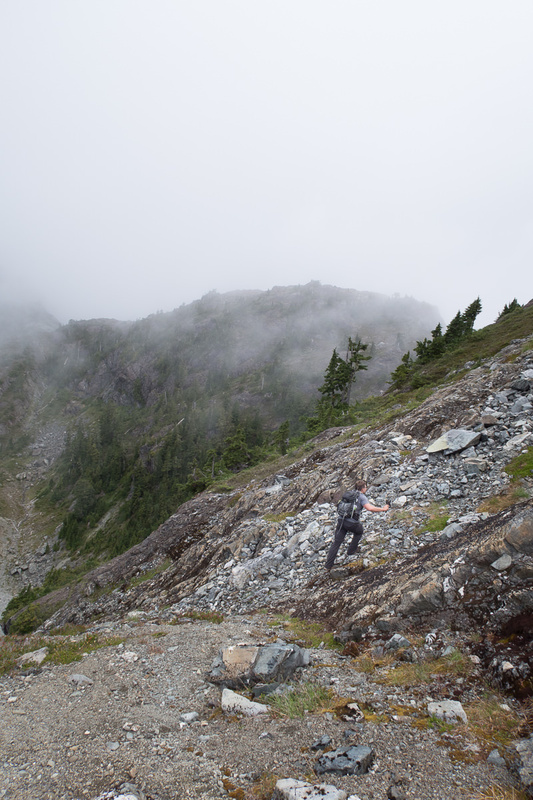 Once we traversed the northwest-facing slope (hiker’s left), we found an easy scramble up over slab rock and a few heather sections, leading to the summit ridge. 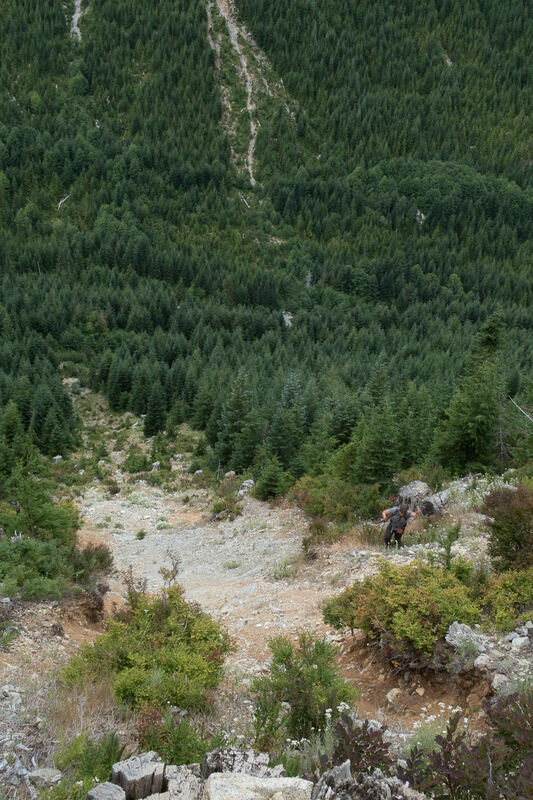 After wandering the precipice for a short time, we decided to hit up both high points on the mountain, as the two points are within a few metres of each other. Sitting on the summit felt like a huge success. It’s not that the mountain was particularly tough (although it did have its moments) nor the view (swirling clouds obscured that), and I’ve certainly summited more challenging peaks. I think the satisfaction came from the speed at which we ascended. For a mountain that we struggled with in the winter, we practically ran up it (well, not really). Our descent was no quicker than our ascent. 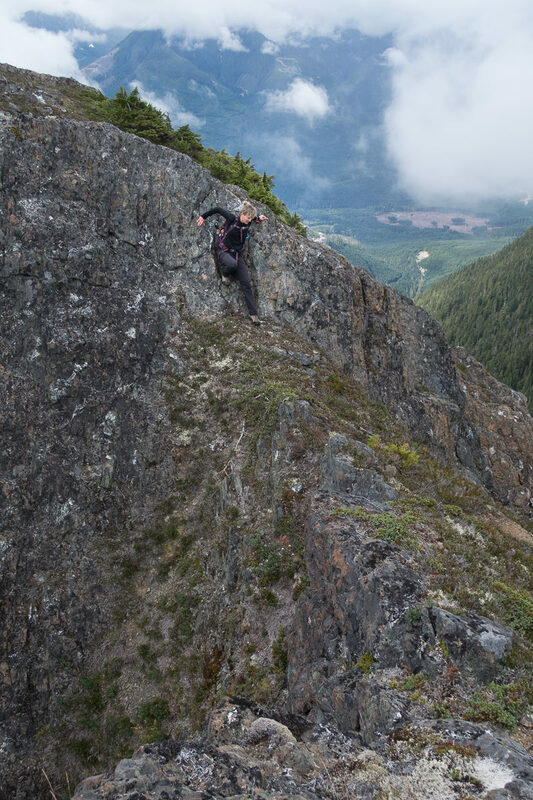 I’ll attribute this uncommon occurrence to some slow down-scrambling, route-finding, and a very careful descent down the steep slide zone. Each component played its role. 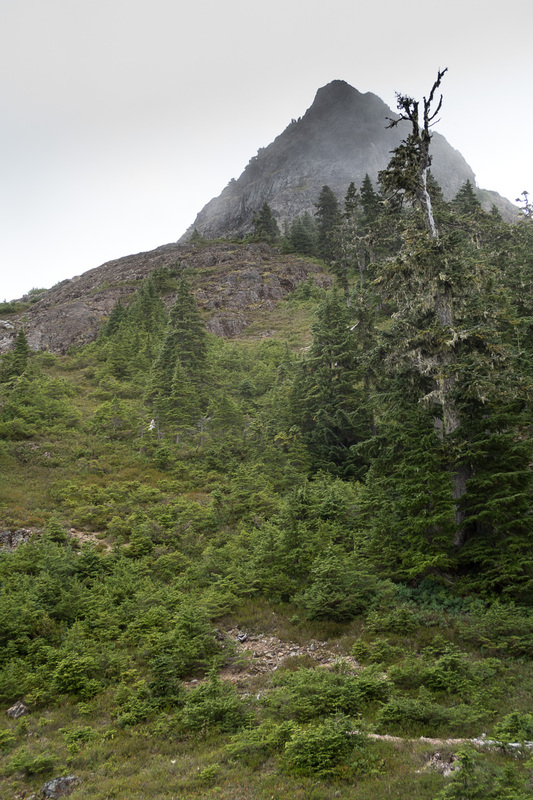 We finished the hike charging through the alder back to the Jeep. Our trip was only a hair over five hours—nearly three hours less than we spent driving for the day’s hike. 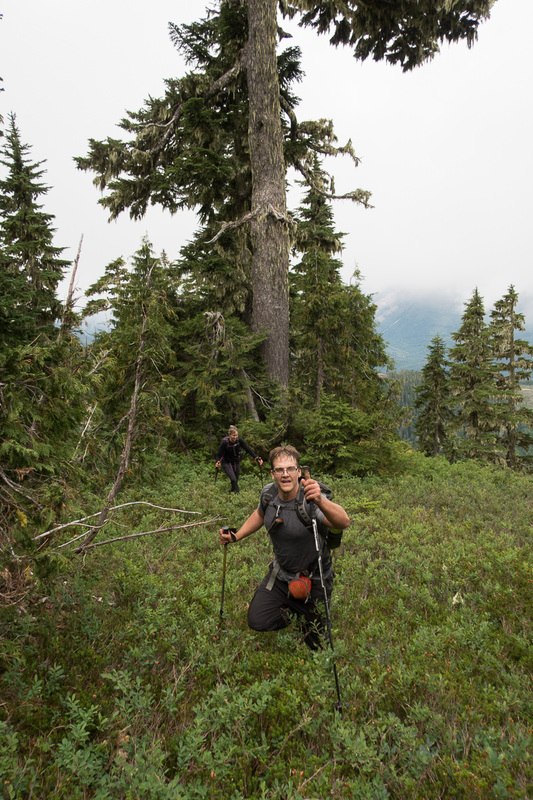 If you’re asking the question, “When should I try to hike this peak?” My answer is, the summer is best; do it on a dry day, with tough pants and long sleeves to survive the bush.